Few artists have captured the essence of the American middle class with the warmth, gentle humor, and charm of illustrator Norman Rockwell (1894-1978). Remembered for the several generations of Saturday Evening Post covers he illustrated, Rockwell had a genius for creating stop-action scenesan art student racing to her next class, a small dog stubbornly blocking trafficmoments with which viewers could easily identify. 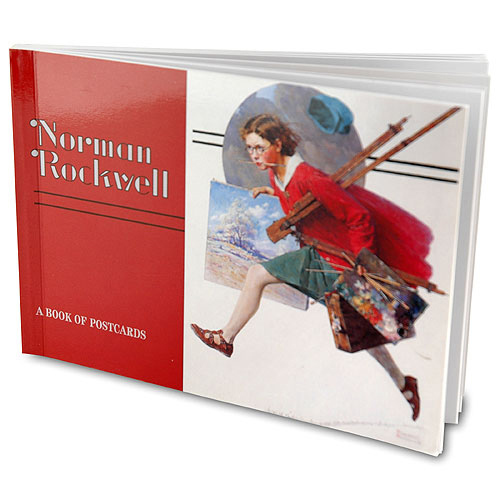 This book of postcards offers thirty of Rockwell's most treasured illustrations. Collection published by Pomegranate. Postcards included are: Shuffelton's Barbershop, Happy Skiers on a Train, Liberty Girl, Adventure (Daydreaming Bookkeeper), Norman Rockwell Visits A Country School, Choir Boy, New Glasses (optometrist), Volunteer Fireman, The Decorator, Fair Catch, Coin Toss, The Rookie, Tired but Happy, The Jury Holdout, Fleeing Hobo, Roadblock, The Bookworm, The Stow Away, The Window Washer, Boy Practicing Trumpet, Country Fiddler, Crestwood Train Station, Ride in the Rumble Seat, Marbles Champion, The Full Treatment, Wet Paint, Catching the Big One, Bridge Game, and Going Out.